First time starter and she brushed the starting gate at the break and was forced to rush up. Once the rider got her settled, she put in a game effort finishing a solid 4th. She’ll benefit from this race for future trips to the paddock. Jose Ortiz had his bumped around at the start and he rushed him up to grab a short lead. Ortiz settled him nicely, and he finished an honest 4th this day. – Good things are coming for this runner from the Todd Pletcher barn. This filly shipped in from Presque Isle and stumbled badly at the start and was forced to take up off heels. She was heavily backed at the windows and sometimes it takes two efforts off of the synthetic to get acclimated to the dirt. This daughter of Bernardini shipped in from Keeneland for the Eoin Harty barn. – Paco Lopez was on cruise control winning by 5 lengths and looked to have plenty in the tank. – Right back off the impressive win she deserves a playback at the windows. This runner jumped right to the lead and duked it out down the backstreet. He bumped his rival and was DQ’ed from the win and placed second. Edgard Zayas was aboard and I love to play back a winner who was disqualified. They know how to win and I see the next effort firing right back. Shipper from Churchill who was a beaten favorite this day. The hot hand of Antonio Gallardo was forced to go five wide and still managed a quick finish for the show spot this day. – Be on the look out for this runner as he’ll be sure to give you plenty to cheer about. Paco Lopez had his filly stalking down the backstretch when she clipped heels with another runner and lost the rider. She was backed heavily at the windows and she’ll be looking for payback next time out. Susan Anderson trainee was restless in the gate and broke poorly. He made up a heap of ground around the far turn and was bested by a nose in the shadow of the wire. – Just a clean trip for this guy and you’ll see something special down the lane. John McKee in the irons for Dan O’Hallaron. They shipped in from Fairmount Park and this mare was flat out rolling in the final stages of the race. The pace was pretty hot for this level and the next time you see her in the entries bet with both hands. Albin Jimenez aboard for Mike Maker and she did everything perfect except get beat by a nose at the wire. She was sent off the odds-on chalk for Dr. Kendall Hansen, and it looks like he is getting ready to have a great year with some talented runners in his barn. Churchill shipper for Mike Maker was sent off the odds-on favorite, and she was circling 6 wide on the final turn showing good interest down the lane. She’ll mature nicely and Maker will have her ready to roll next up. – She is a three-year-old now, and I’m looking for good things to come from the red-hot Maker barn. Thom Drury runner had the services of Albin Jimenez back from Tampa Bay Downs for the winter. They broke from the outside post and this may not have worked to their favor. The Drury barn is known for getting a runner ready off an average effort and this one fits the bill perfectly. Finishing 4th going five wide into the final turn, and coming up short looks like a race to build on. are looking for her first win picture. From two mounts she has a solid third place finish to her credit. “Off the Charts” Trip Notes. Here are some runners who could use a playback or a good hard look next out, including some runners exiting the 2016 Breeders’ Cup. Eric Cancel’s mount seemed to lose traction leaving the starting gate. He made a solid attempt and spun three-wide on the turn to finish up third this day. Antonio Gallardo in the irons and one thing is for sure. This guy can flat-out horseback. He rode four winners on the card, and his mount was carried four wide coming up a little empty down the lane. Next out should have him moving right back into top form. Top rider Paco Lopez in the driver’s seat and his runner stalked just off the leaders and inhaled the field to win by an easy 5 1/4. – He needs a good playback next out as he completed this task with plenty left in the tank. Luis Saez in the saddle for the Joe Sharp barn. His colt stumbled at the start and closed with a strong flourish four wide on his way to the winner’s circle. This son of Kitten’s Joy may have some good things to come and could use a good wager right back next time out. Mike Smith for Baffert, and their filly broke slow from the gate in the #12 post. She was seven wide down the backstretch and 5 wide into the final turn. She managed a to finish with good energy to be 3rd as the beaten favorite. Gary Stevens in the irons and broke inward at the break. He was stalking in a perfect trip when Stevens lost his whip in the final 1/16th to be bested by a nose at the wire. John Velasquez in the saddle for Bob Baffert and he was facing two monsters this day. He wouldn’t have caught Chrome or Arrogate going around another lap, but if he catches just a solid field, he’ll give them fits as he finished up with good energy to show he is getting ready. Horses to Watch for AGameofSkill.com visitors. Put these runners in your Stable Alert. Irad Ortiz was up for Christophe Clement and this colt saved ground and started to show good interest. For the next 1/8th of a mile they were caught in traffic and Ortiz was forced to tap on the brakes many times. Once free he spun three-wide and finished with a strong late kick. The (G-1) Frizette was a tough race and this gal bobbled at the start costing her precious ground as a highly wagered player in the field. Give her a clean trip and the outcome may be a little different. She did very little wrong except hook a monster on the improve off the shelf in Lady Eli, one of the best turf distaffers we’ve seen over recent y ears. Calisi tipped off the rail and looked prepared to mount a challenge but the winner had more in the tank. This was a very good “builder” race where she can be counted on for improvement. Mike Smith is the new Eddie Arcaro. Both rode about 1/3 the mounts of their counterparts and mainly tacked up in the big money races. – He set the pace under salty fractions and was bested in the shadow of the wire. The best is yet to come for this sprinter. Florent Geroux is in the ‘zone.” He did everything right and was bested by a fast closing Camelot Kitten who had clear sailing about four wide with no traffic. Geroux fits and she’ll give them fits next out. Got Rebates? No points, no waiting – just the VIP service you deserve. Click here to learn more. For the sake of being master of the obvious, this gal has plenty in the tank and didn’t burn her up chasing the leader. The likely Breeders’ Cup Mile favorite closed with good interest and will be a monster next out. The hardest part will be the waiting. Barring any last minute hiccups, Tepin is just fine and received a great deal of work from this race. Just think, she’ll be dreaming every night of chasing a leader who stole the race by ten around the far turn. She won’t disappoint, just be patient. Jose Ortiz got motoring late around the final turn and brushed a nudge with Mondialiste. This little bump may have cost her the race as she hit another gear at the 1/8th pole kicking in the after-burners. No worries, Ortiz will move just a little sooner next out. Here are some runners you’ll want to keep your eyes peeled. These runners had a compromised trip and they deserve a good hard look before making your next wager. Put them in your Stable Alert or Stable Mail notification service. Montana Kid (AP 6/24/16 – Race #7 – #7 – 1 1/16 turf) – Jose Valdivia had the call for Larry Rivelli and his mount bobbled at the start and was taken back to the end of the field. He was so far back he looked in another zip code and I started thinking he had no chance. As the field rounded the 1/4 pole he kicked into an incredible strong gear and started weaving through traffic like the Indy 500. He was on track to thread the needle and go right past when a quitting runner nudged and bumped him a little and detained his late run by a stride which caused him to not get his picture taken this day. He needs a better break, and there is no doubt that this runner who was coming off two wins in and dropping in class will show much better next out. Wild Chatter (BEL 6/22/16 – Race #4 – #7 – 1 1/16 turf) – A three-year-old filly going for three-in-a-row on the greensward, and she deserves a good play next time out. Junior Alvarado in the irons and his mount was shut off at the 1/8th pole and was forced to shift off the rail. Once he found clear sailing he finished up with a great late kick in the final stages. T R Crew (BEL 6/22/16 – Race #6 – #2 – 1 1/16 dirt) – Angel Arroyo had the call and he did a perfect job of stalking along the rail saving precious ground. He was in the second flight and shifted off at the 3/16th’s pole and had to battle between runners to find a gap for a few strides. Once he broke free he was drawing down on the leader and was beaten by a dirty nose. A cleaner trip gets this runner right in the winner’s circle next up. Guyana Cat (BEL 6/25/16 – Race #5 – #8 – One mile dirt) Jose Ortiz returned from his suspension and came back ready to pick up his business. – His mount was bumped soundly at the break and dropped back to the rear of the field. He was forced to swing three-wide at the top of the lane and finished with a sense of purpose. If Jose Ortiz stays aboard next out bet early and often. R Dirteater (BTP 6/25/16 – Race #2 – #3 – One mile dirt) – Marco Ccamaque had the mount and his runner was off slowly from the break and saved ground all the way around. Once he angled out for clear sailing he finished with good interest and should bring the heat next time to the races. Infiltrate (BTP 6/25/16 – Race #8 – #4 – 1 mile and 70 yards dirt) – John McKee was the reinsman and had a perfect trip saving ground. Once produced, he kicked into another gear and finished with a solid late kick. He was beaten by a head in the affair right at the wire, and the winner lost his whip in the direction of Infiltrate in the last 40 yards. That tiny distraction was enough to keep him out of the winner’s circle. Upright Stuff (BTP 6/26/16 – Race #8 – #8 – 6f dirt) – Euclyn Prentice Jr. was in the irons and he was going for his 4th win on the card. – He tracked the speed and made a move at the 3/8th’s pole weaving in and out of traffic. Once they past the 1/4 pole he was attempting to go through a hole that closed very quickly on him forcing him to take off heels and shift to the outside finishing fourth. Watch this runner next up as he won’t disappoint. Howie’s Tiz (BEL 5/26/16 – Race #4 -#2 – 7f dirt) – Angel Arroyo had the call and settled his runner out nicely. He made a game move and tangled horns with the a bear from the David Jacobson barn who was the big chalk. He was forced to be second on this day, and next time out he’ll give them fits down the lane. Silent Secret (BTP 5/28/16 – Race #7 – #3 – 1 mile dirt) – jockey Geovany Garcia’s mount had his head turned in the starting gate and spotted the field about 20 lengths once the latch was sprung. It looked as if all hope was gone until he started flying down the backstretch and finished a quick finish third beaten only one length. The best part is he was facing a very tough speed bias and still overcame the poor start. He won’t be a secret at the windows next out. Turkomani (GP 5/25/16 – Race #5 – #7 – 1 1/16 turf) – Emisael Jaramillo had a nice runner ready to score. He moved his mount smartly along the rail to save ground and at the 1/4 and was forced to check sharply to avoid running up on heels. He found some daylight against the rail and dove over to save ground, but it was a little too late as the gap was slammed shut forcing him to take hold of his mount. More Red Roses (IND 5/25/16 – Race #3 – #1 – 6f dirt) – Fernando De La Cruz in the irons for Denis Cluey, and they have a gal in their barn who needs a good bet next out. – She trailed the pack for 3/4 of the race and started making good headway around the far turn. She was moving very well along the rail and encountered a bit of trouble getting a clean trip. Next time out she’ll seal the deal ! Miz Liz (IND 5/25/16 – Race #4 – #8 – 1 1/16 turf) – James Graham was in from Chicago for Christophe Clement, and she was forced to steady sharply multiple times during the race. Once she looked be under way she was “smashed” in between quitting runners and forced her to take off heels. Bet with confidence next time to the races. While OptixPLOT will give you an excellent overview of the race shape, race flow, and pace dynamics of the race, helping you choose which races offer the best opportunities, OptixNOTES will help take your handicapping into the 21st century. OptixNOTES is a proprietary trip-handicapping past-performance platform that includes performance ratings, trip descriptors, and form projections (along with detailed extended comments) from the OptixEQ team of expert handicappers. Think of them as past-performance grades and trip descriptions that can help you better understand and predict a horse’s current and future form. 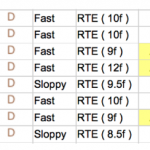 OptixNOTES are available for most of the major tracks on the major circuits, and they are an incredibly valuable tool when it comes to assessing a horse’s chances of winning a race. Since watching replays is incredibly time-consuming—and sometimes fruitless if you really don’t know what you are looking for or how to use that information—the OptixEQ team does all of the work for you, grading a horse’s previous trip/performance while also commenting on that trip and sometimes even projecting where that horse might be headed in the future. The other cool thing about this platform is that it’s vibrant—everything is color-coded for easy readability. Positive attributes are green while negative ones are red. This type of trip-handicapping data is available for several tracks on the major circuits, giving handicappers a massive edge when it comes to assessing a horse’s form. For more information on how to use OptixNOTES, visit the product information page at: https://www.optixeq.com/?products=optixnotes#doc. Tomorrow in the conclusion, Part III, we take a look at OptixGRID as well as the OptixFIGS for all of the Kentucky Derby preps. You’ll want to commit these runners to memory as they may offer up a bit of value next time they enter the starting gate. Japhir (AQU Race #2 – 3/26/16 – #5 – 1 mile 70 yards dirt) – Manny Franco in the saddle for Bill Mott, and they were settled in stalking behind a dawdling pace. When they turned 1:16.3 for 3/4, he looked to have his work cut out. 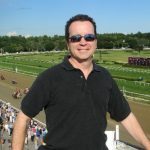 – The slow fractions usually play against the closers, and he finished up gamely splitting runners trying to wheel in the chalk leader from the Pletcher barn. – Give him an honest pace, and he’ll stalk the leader and inhale them down the lane. Ousby (GP Race #5 – 3/26/16 – #6 – 1 mile on the turf) – Nik Juarez up for trainer Marcus Vitali, and they have been the talk for awhile for the solid team they have become. This son of Shakespeare got himself a little tight at the 1/4 pole and had to shift over to the rail and await room. He finished with a solid effort, but a little cleaner lane would have been very welcome by the punters. Our Azure (GP Race #5 – 3/25/16 – #1 – 1 1/16 on the dirt ( Originally scheduled for the turf)) – Jockey Eddie Nunez struggled with his filly down the backstretch, and appeared to have trouble getting her to settle down. Once she got comfortable, she put in a very nice effort going past the chalk only to be bested late in the lane. She may be better suited with a solid gate break, and hopefully we’ll see a little better price. What Power (GP Race #2 – 4/2/16- #8 – 1 mile on the turf) Paco Lopez had the call, and he ran into trouble in the first turn and had to check up. Lopez saved ground and looked for a hole to make his charge and was all dressed up and no place to go with his mount. – Once he shook loose, he made a solid bid for minor awards. A clean trip may be just what the doctor ordered. Songoficeandfire (Race #11 – 4/2/16 – #7 – 1 1/8 on the turf) – Junior Alvarado had the call, and his mare settled out nicely and saved ground along the rail. He looked to have his charge in a good spot when he waited for a seem to open at the top of the lane. Well, it never appeared in a timely fashion, and bottled her up until she finally saw daylight and exploded for a strong bridesmaid effort. 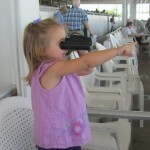 – I’ll bet dollars to donuts she’ll tip off the rail nearing the 1/4 pole and give them fits down the stretch. Wagering on Keeneland? Get the edge you need to beat your pari-mutuel competition. Susie Bee (FG Race#6 – 3/26/16 – #10 – 1 1/6 on the turf) – top rider Javier Castellano in the saddle for Mike Maker. She was kept in under a hammer lock of a hold waiting for room down the backstretch. Once she shifted off the rail looking for a lane, she brushed against Christie’s Ready and never found full stride but managed to still show very good interest to finish up with good energy. Eagle (Race #7 – 3/26/16 – #10 – 1 1/8 on the dirt) – Javier Castellano settled near the back of the pack and brushed repeatedly with Storm Driver into the first turn. – He relaxed a bit and was forced wide to find running room, and Castellano gave a “pop of the crop” to give a strong hand ride to the wire not using all the gas in the tank. – Next up gets has him soaring down the lane. Scout Leader (OP Race #3 – 3/31/16 – #2 – 1 1/16 on the main track) – Joe Rocco did an excellent job making up a heap of ground, and dove to the inside rail as the eventual winner started drifting out inside the 16th pole. He ran a very game effort, and 2nd money on this day was a good indication of efforts to come. – He’ll be the major danger next up. Hughhoofner (TP Race #1 – 4/2/16 – #8 -6f on the poly track) – John McKee in the saddle for this speedster, and he broke out before the start and expended some well needed energy. McKee sent the Bill Connelly charge in the four wide path about the 3/8th’s pole. – I watched him warm-up, and he looked better than a shiny penny. – Speed balls need all of their energy, and he left most of his on the track with the premature gate break. The Kentucky Derby is only 47 days away. I can feel the energy in the air. The roses, the atmosphere, and the red- hot betting action that may be some of the best all year long. But just hold your horses and don’t get ahead of yourself. After we’re done tearing up our basketball brackets, we need to realize there is plenty of incredible Thoroughbred action coming our way. So sit back, enjoy, and keep your eyes peeled for these ponies the next time they hit the track. Real Sugar (GP Race #9 – 3/20/16 – #9 – 5 1/2 on the dirt) – Jeffrey Sanchez was the pilot and is known for being a solid gate rider. His mount was bumped solidly leaving the starting gate and still opened up a 2 1/2 length lead going 22.2. – He established a clear margin and ended up a little leg weary at the end. In short sprints the gate break is ultra-important, and his ability to stay focused and still open up is promising. – If he comes out without problems, I wonder what he would have done in the race ? – I think we’re going to find out next time at a solid price. She’s Dynamite (GP Race #5 – 3/16/16 – #1 – 1 1/16 on the turf) – Led all the way around and sped up at the 3/4 to go 1:11.3 only to be bested in the shadow of the wire. She was making her second lifetime start on the stretch-out in distance, and catch her if you can next out. – Play close attention to how far she is going and unleash the bankroll from there. Cape Carol (GP Race #6 – 3/16/16 – #4 – 1 1/16 on the turf) – Jockey Tyler Gaffalione in the saddle for Buff Bradley. This daughter of Cape Blanco was at the back of the pack and stayed glued right to the rail all the way around. She began to thread the needle at the 1/4 pole and looked like a winner. – The weaving in and out of traffic may have caused her to be a bridesmaid as the winner went right on past with a clean 3 wide move. – She’ll be looking for payback next out with a cleaner trip. Wolf Man Rocket (OP Race #6 – 3/19/16 – #6 – 1 1/16 on the dirt) – Calvin Borel was aboard this beaten favorite who was in very tight at the start of the race. He had to go five wide on the second turn to get back into his best stride, and finished up gamely to get minor awards. 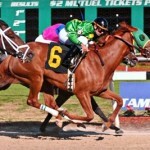 Borel is not known for circling the field, and the mishap at the gate break was not the best beginning. – Love the “beaten chalk” angle next time back, and who knows, maybe we’ll get a much better price. Twirling Tiger (SA Race #1 – 3/17/16 – #6 – One mile on the turf) – Santiago Gonzalez was in the irons and his mount was bottled up and headstrong down the backstretch. He was forced to wait behind a wall of runners and when the 1/4 arrived was forced to go three wide to find running room. – The trip was not the smoothest ride, but his late acceleration was very promising considering all of the factors. GOT REBATES? If you are playing without any type of significant rebate, you’re throwing money away. Click here to learn more about horse racing rewards from a U.S.-licensed firm. At the time of this post there are just over 70 days until we’ll be watching the 142nd renewal of The Greatest Two Minutes in Sports – the Kentucky Derby! But don’t jump the gun just yet, here are some runners you’ll want to keep your eyes peeled the next time they take the track. Mo Tom (Race #11- 2/20/16 – #2 – 1 1/16 on the main track) – Jockey Corey Lanerie was in the saddle for Thom Amoss, and this race was on the minds of every horse player that watched the Risen Star Stakes. – This son of Uncle Mo was far back in the field and didn’t move too early. Lanerie had two graded stakes to his credit this day, and the best was yet to come. He received a little urging and came off the rail briefly to pass tiring runners and dropped right back over to the fence. – Saving ground was a perfect move as he was starting to accelerate when Bistraya drifted over causing the colt to swerve and check sharply. Once Lanerie was in the clear they were inside the 1/8th pole when his mount picked up his action and started to close strongly. – Distance shouldn’t be a problem, and if all things come back fine. He’ll learn from this effort and only get better down the road. Twenty in One (Race #3 – 2/15/16 – #2 – 7f on the dirt) – Closed very fast down the lane under the guidance of Rafael Hernandez in a 3/4 time of 109.2. – She caught a “speed fest” on this day, and anything that isn’t as salty should fit her like a glove for the Tomlinson barn. Purely Bay (Race #7 – 2/15/16 – #11 – One mile on the turf) – J.J. Castellano had the call and his runner was making a “second off the layoff” run. Castellano knew he couldn’t catch the leaders as he weaved through traffic trying to save ground, but his dead last explosive run may be just what handicappers could expect next out. Looked like he had plenty in the tank wrapped up, and that may work out well for the punters. Akron Gold (GP Race #5 – 2/21/16 – #8 – 1 mile on the turf) – Joel Rosario was named, but was on the shelf due to an injury. – J.J. Castellano picked up the mount, and this three-year-old daughter of Medaglia d’ Oro was pushed out going into the first turn. She settled nicely after the losing some ground, and spun around the field at the 5/16th’s pole three wide. She drew off and looked like a winner, but was bested in the shadow of the wire. – All said and done, losing ground on the first turn and going wide as they approached the stretch may have been just enough to get beat this day. Hard to fault the connections as they few mistakes, so I’ll file this one under bet with both hands next out. Fourth Watch (SA Race 3, 2/6/16, 6 1/2 furlongs turf) This Tapit 3yo filly was very professional coming up inside in 6.5f turf debut to win going away. You simply don’t see many first time starters win like this. She’s got a bright future for Carla Gaines and owner Spendthrift Farms. Lucy De (SA Race #1 – 2/15/16 – #4 -One mile mdn turf event) – Santiago Gonzalez had the assignment for Mike Puype, and did absolutely nothing wrong. – This may be a case a running a “winner’s race” but not getting your picture taken. This was a very strong effort, and they were bested by the (1-2) chalk getting nailed at the wire by a head. – If Gonzalez stays aboard and Puype keeps to task, you’ll want to bet early and often when they enter.